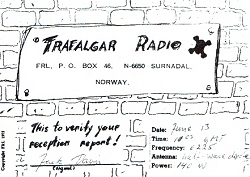 In January the 25’th, 1976, the first broadcast from Trafalgar took place at 11.10 UTC. They used 6225 kHz on SW and 228 m on MW. DJ’s was Bobby Young, Lord Nelson and Mike Owens. The last time this station is mentioned are the 29’th of august 1976.